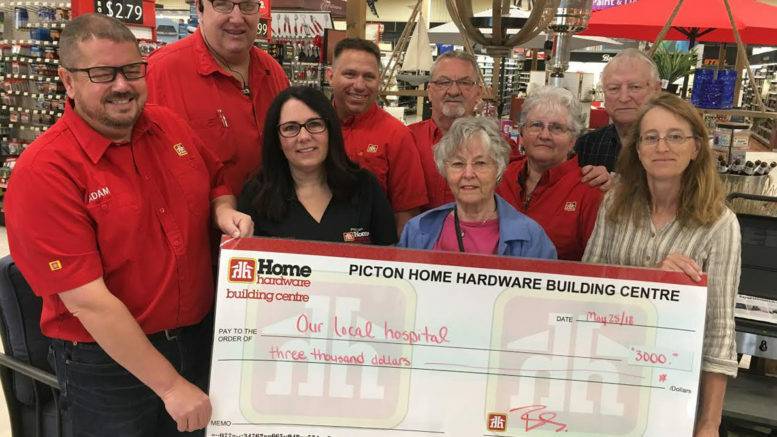 Picton Home Hardware was the first business to publicly support the proposed redevelopment of the county’s hospital and they showed Friday they’ll continue to support the project. That morning, the store gave $3,000 from the store’s electronics recycling events in support of the Prince Edward County Memorial Hospital Foundation’s Back the Build campaign, bringing its total gift to the campaign to $4,300 so far. With that donation, the store has given $31,226.99 to various foundation efforts since 2010. “We make money on recycling electronics and we take that money and give it to the hospital,” said store owner Adam Busscher. He added it’s a nice form of giving as it allows the store to provide a service for its customers and it isn’t asking them to reach into their pockets. The next weekend electronics waste collection at Home Hardware will be June 9-10.